I'm taking a new tack. I dunno why. My day started around 3:00 a.m. I tossed and turned about an hour before getting up and making coffee. I putzed around balancing my checkbook, doing laundry, and junk like that. I got ready for spin class and joined Karen and the boys, Big Lar, Jeff, and Drake at 5:30 a.m. I felt more energetic than Wednesday, which is good. I barely survived that class. I came home and joined Pat for more coffee, showered and went back to the Y to sign up for classes that start again next week. Time to go get my driver's license renewed. I thought I would check on the title to my new used car. I was informed that the title was assigned to my bank (in another town) due to having a lien on it. I told him there wasn't a lien on it, and of course that was not his problem. Next I checked with my bank, and Leslie was kind enough to investigate this problem for me, and no, there is no lien, and no, they didn't have the title. She even called the dealership who submitted the paperwork and after a some pretty ludicrous exchanges, like, "She didn't buy a car here," it was agreed how they would fix it. I stopped by a local church who is sponsoring a suicide prevention education program and helped the secretary work up a flyer from a template. My computer wizardry skills are pretty damn amazing. Then I tanned for six minutes followed by grocery shopping, and toasting a leftover peanut butter sandwich in the toaster. I don't think the peanut butter even ruined it. I then napped for about half an hour and proceeded to the most exciting part of my day. With the assistance of a travel agent (that was a joke about my computer skills) I booked my July flights to Malta. I will be meeting Betsy and Ethan in Chicago and we are flying to Malta together via Frankfurt. I will travel home alone. You see, Betsy's friend is the Ambassador to Malta and so this once in a lifetime opportunity is too good to pass up. I then volunteered at the food pantry behind my house, and it was a slow day, allowing me to catch up with an old acquaintance who was teamed up with me for the day. That was pretty cool. I threw some dinner in the crockpot and left out for Happy Hour, Gentle Flow Yoga class on the square. Julie C was filling in for Julie M and we stretched some new muscles. It was so very nice. After Shivasana, we had hot tea, which is such a lovely ritual. As I was cleaning up after dinner, I realized my only opportunities to see what could possibly be my dad's last play was tonight or next Friday. I figured I better go tonight. His part was an off stage voice on the intercom. Upon leaving the theater, snowflakes were blowing in with a strong wind. Crazy, I mean how could that be? Mother nature, or Father global warming, had us in late spring the last week or so, and I have the allergies to prove it! I was strongly considering getting a doughnut after the show, but settled for a peach Greek yogurt at home, and twiddling my fingers over the computer keys again. I just noticed what a ubiquitous part of life computers are. So that is what I did with my day off. Do you see why I need a three day weekend every week? You should be here. Everything is swirling around. The pain is less acute, but the weight heavier. I will keep swimming, for you, Adam. While in Florida, I built a sandcastle for Adam. 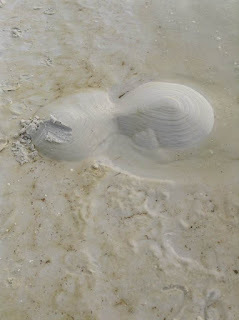 It wasn't much, nothing like the effort he put into his sandcastles. I just wanted to do something for him. I drew his name and the year in the sand. The next day I walked down to the area, and found some remains. I was pleased that some of it was still there and I took this picture. You can almost see the 2 in the lower right corner. I left his name on a giant chalkboard outside the movie theater. The next day when we went back, the whole board was erased and new chalkings were drawn. A little like life, nothing is permanent. 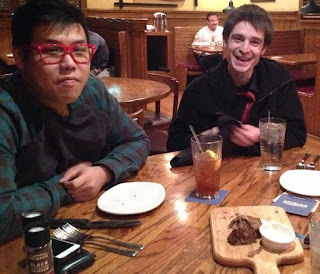 And so begins the second year without Adam. The year 2017 that he was never alive in. The feelings come flooding back at any time. Just now, reading an article about hospice. 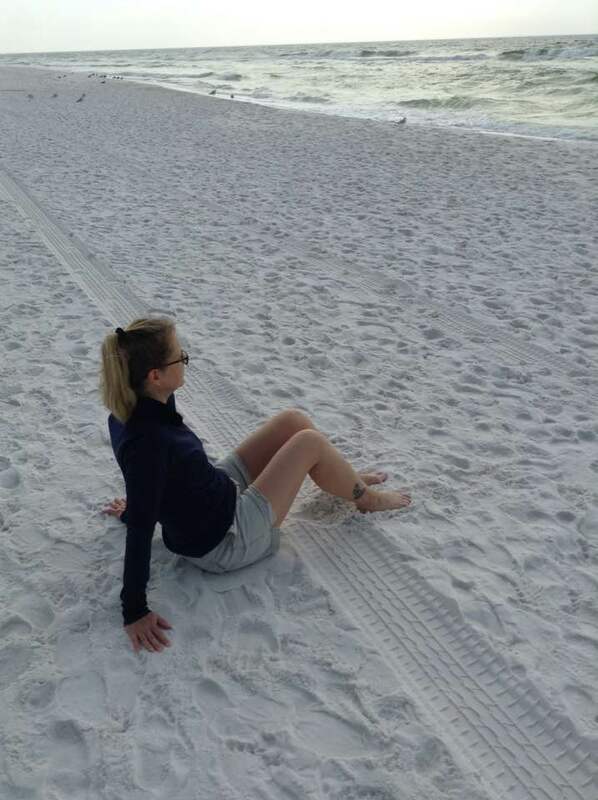 On our trip to Florida, so many things reminded me of Adam: I-Hop, vaping, Men's Wearhouse, Sonic, Impalas, Chattanooga, Asian restaurants, tea, sandcastles, H & M, Barnes and Noble. These reminders give me pangs of nervousness and a sick feeling in my stomach. Knowing it's real. 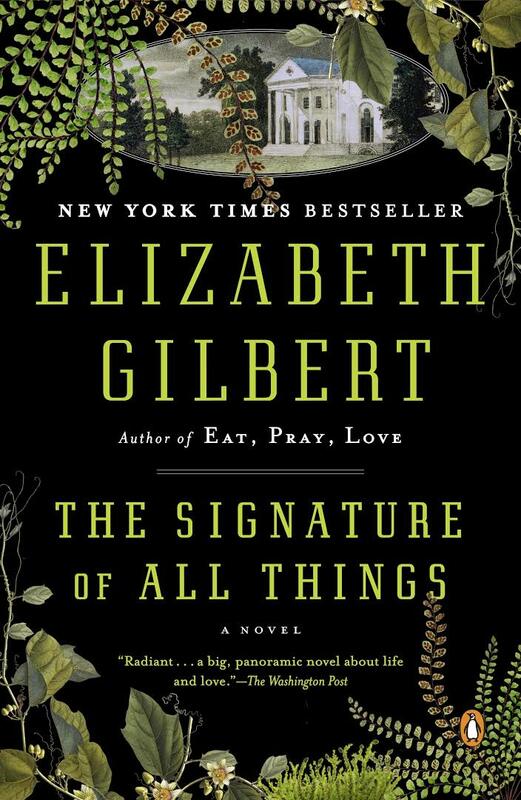 Unlike most women of a certain age, I have not read Eat Pray Love by Elizabeth Gilbert. I did pick up this novel with a funny name by her, and would not have believed reading the first 100 pages how much I would come to love it. Mixing up botanical exploration and study, 18th and 19 century shipping, a love (?) story, Tahitian religious history, mental health and abolition into a cohesive novel is no small feat. Gilbert somehow manages it. Alma Whittaker, the main character, is the daughter of a wealthy botanical shipping magnate, and a naturalist herself. A bryologist, to be exact. An expert in the study of mosses. How captivating, you say? 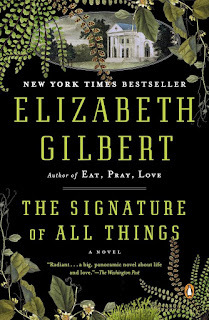 What I admire most about Elizabeth Gilbert and this epic 500 page tome, is her exquisite research detail, ability to keep the language and tone true to the time period, and the oftentimes hilarious, and all together quirky characters and dialogue. There is Retta Snow, the pinheaded and carefree neighbor and Ambrose Pike, the angelic, enigmatic hero, both of whom speak in the most original voice I probably ever heard in a book. On page 229 we find out the meaning the strange title. It comes from the writings of a 17 century German cobbler who had mystical visions about plants. Jacob Boehme believed that God left clues for humanity in the natural world. That's why walnuts, shaped like brains, are helpful for headaches, and basil, shaped like the liver, can help with ailments of the liver. He called God's imprint "the signature of all things." Alma develops a theory of the natural world simultaneously with one of the greatest scientists of all time, but hesitates to publish her results, which she calls "The Theory of Competitive Alteration." When the ultimate theory is actually published (we know it by another name) by someone else, she is at peace with it. intelligence. He died searching for that union. And so the novel ends with a thoughtful debate about the greatest spiritual question of all time. What a satisfying ending to a magnificent story.